I am generally disappointed with most things chocolate in Brazil. Cue the violins and sad clowns because I am a devotee of Chocolate Church, the darker the better. You would think that in a country where cocoa grows wild, for chrissakes, that the chocolate here would be fabulous. So far, not so much. I crave gooey, dark chocolate cake and a good chocolate truffle ice cream. Never mind the fancy chocolate bars with lavender or sea salt or chili pepper or… You get the point. Maybe I’m just picky. Maybe I’m looking in the wrong places. Not that it keeps me from trying, over and over and… over again. These chocolate cookies made the grade. 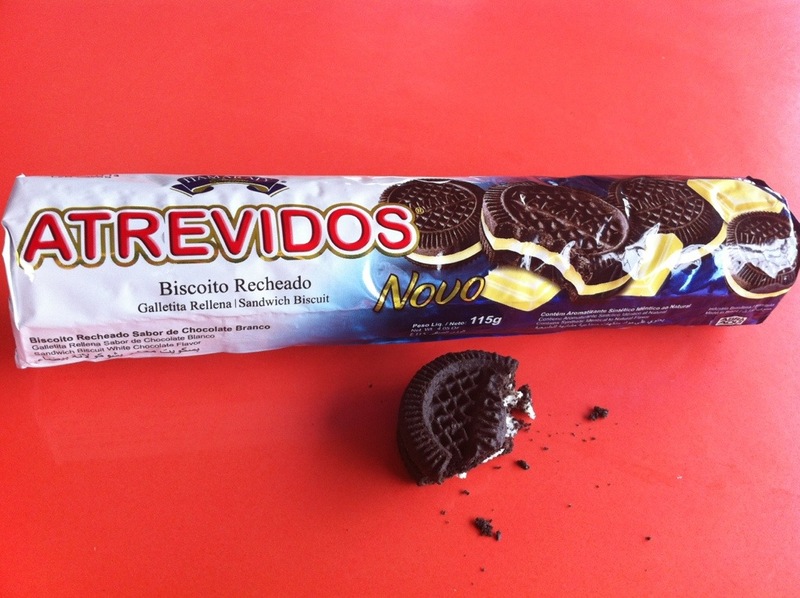 I love the name as well: “Atrevidos” = “Bold/Saucy Ones.” They’re really good, almost an Oreo. Like a Hydrox, I guess. Good enough that the package might not make it to share with my classmates for afternoon coffee. I know what you mean. Both chocolate biscuits and bars leave me underwhelmed although one positive development has been that I recently realised that Mars bars are branded as Milky Ways here. Took me a year to figure it out mind! LOL! Is that what a Mars Bar is? I had always heard mention of them. I assumed they were something different. They are Milky Ways in the USA. Pretty much the same thing really. I’ve never been to the States so it took me a while to work it out. Was a pleasant surprise though! On the savoury side I’d like to recommend the Sal Lebre line of products.